The weekend. Essentially seen as those two days right at the end of the week where it is completely acceptable to do absolutely nothing. Particularly for those of us who've been holding down a 9 to 5 all for the other part of the week. The weekend is our time off, but sometimes it's nice to keep ourselves busy and sometimes the weekend can be used as a great way to motivate ourselves for the week ahead and get organised ahead of time. 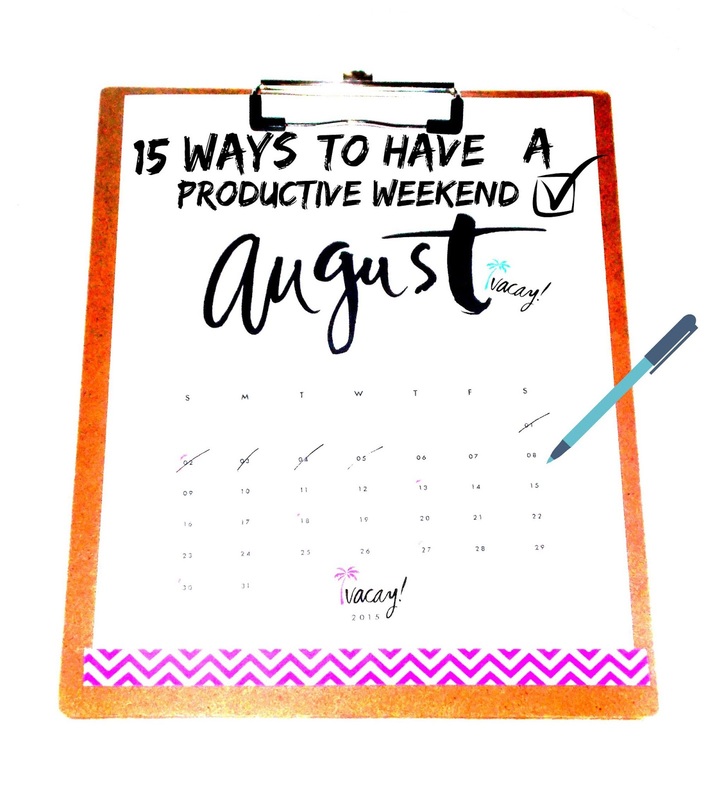 So today I thought I would share with you all, 15 ways to have a much more productive weekend. Complete that to do list! - Let's be real. It isn't always possible to get that list of jobs to do all finished by the end of Friday. Rather than leaving it alone until Monday, why not get ahead of yourself and get those jobs done before even more mount up! Household chores - Boring, I know but definitely needed to be done. On the weekend I like to make sure I get my room hoovered, my desk cleaned down, my make-up brushes washed and any other bits and bobs that may need doing. Pamper yourself - This seems completely the opposite to productive but it doesn't have to be. Spend a long, good few hours really enjoying yourself. Have a nice bath accompanied with some face mask time, perfect your brows, paint your nails, read a magazine. The works! By the end of the session you may have learnt something new in that magazine you picked up and you'll be feeling super refreshed by the end of it all. Plus it would have killed a good amount of time! Write blog posts - I'm guessing 90% of my readers are bloggers and so why not spend your weekend getting ahead for the week and writing all of next weeks posts up already. It seriously helps you save time for other plans during the week and makes you feel super organised! Go out and explore! - If you're working throughout the rest of the week, you probably don't have a lot of time to go out and browse. I usually always have something I need to go out and purchase whether that be for an upcoming blog post or an event. So you're killing two birds with one stone, being productive by staying out of the house and ticking something off of your to do list; perfect! Learn something new - We are never too old to teach ourselves something new. Whether it be a new tool to learn for your blog such as affiliate partnership and HTML or maybe you're going abroad this Summer; it could be helpful to research a bit into some basic sayings in the language of the country you're visiting! Bake - Baking is always something fun to do and you can literally make anything. The ideas are endless and it could be as easy or as hard as you want so go challenge yourself. Practice your make-up - When I'm bored I love sitting at my dresser and trying out some new make-up looks. I recently taught myself how to do a cut crease and it was actually easier than what I first thought! DIY - Similarly to baking, I love creating things and copying some little DIY's. Whether it be a face mask or personalising your own mug you will certainly feel a sense of achievement when you have completed your project. Pinterest have so many ideas, you definitely won't be bored! Go on a hike - Whether you want to climb Mt Everest or simply walk the dog, it's nice to get out there and enjoy nature sometimes. Similarly going on a run is a great way to explore nature and burn some calories whilst doing it! Declutter your space - Whether it be reorganising your wardrobe or make-up collection, this will definitely keep you occupied for a long time and you may even find something you completely forgot you even had. The rules with clothes, if you've not worn it within a year; get rid. So not only are you becoming more organised, but you might just find a few bits to sell and therefore make some good cash. All in a days work aye! Read blog posts - Reading other bloggers posts doesn't only just pass the time but you can gain new skills by studying how other people write and structure their posts. You might gain some new post ideas and a find a couple new people who you want to start following along the way. Perfect! Start a YouTube channel - This is something I personally have wanted to do for the longest time but I really lack the confidence to do so. But if you don't, then why not give it a go? You'll be passing the time, trying out something new and maybe even develop some photography and video editing skills along the way. Plan ahead - The other day I decided to sit down and fully plan out everything blog related I have to do from now up until September 4th. That includes when posts need to written, photographs need to be taken and edited and lastly when to hit that publish button. This has helped me organise my time so much better, I have a lot of posts to go up in August so I'm finally feeling on top of my game. And if all else fails.. You could always just sit in bed and watch Netflix with pizza and ice cream. That's productive, right?! I hope this post helped at least some of you with what you can do this weekend if you find yourself feeling bored. The Summer is nearly over and it's about time we made the most of it and started becoming a little bit more productive. Until next time..
How do you make the most out of the weekend?